How did Iceland become a deforested country so quickly, and what are the native trees and vegetation that grow here? What is the future of Icelandic forests, and are there any forests that you can visit during your trip to Iceland? Read on for all there is to know about The Forests of Iceland! One thousand years ago, upon the then recent settlement of Norsemen to Iceland, approximately 40% of the countryside was forested. Today, the island is most widely known for its starkly beautiful, yet treeless landscape. What went so wrong in those intervening 1000 years? Within a few centuries after the initial settlement, Iceland would prove to be one of the worst examples of deforestation ever on record; where there were once trees now sat grazing lands, barren soil and young grass, an environmental turnaround the likes of which have not been since. But how did Iceland’s forests disappear in little under three hundred years? The answer lies, of course, with the people who moved here. 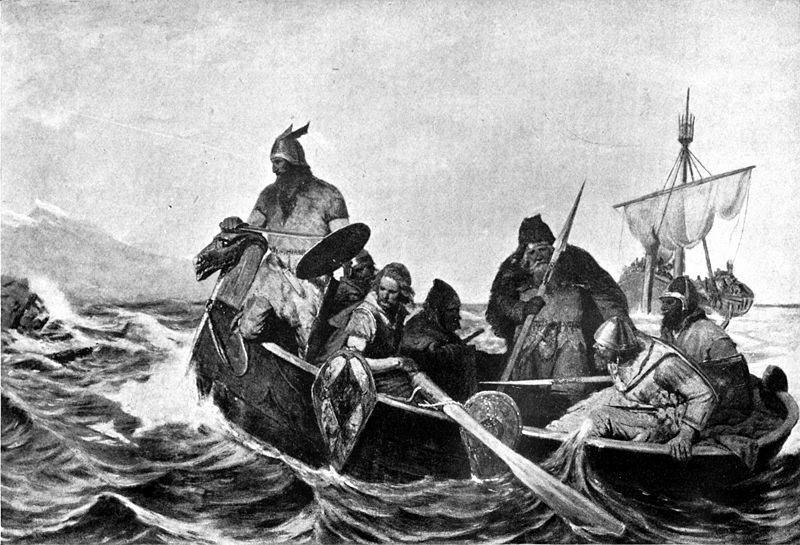 Still, there can be little blame thrust upon these ancient settlers; after all, with conditions as there were, timber was an essential source of fuel (i.e; an untapped well of warmth against the cold Icelandic winters) and as construction materials for buildings, boats and fencing. Wikimedia. Creative Commons. Guerber, H. A. It must also be remembered that, up until just over a century ago, Icelanders were among the poorest people on the planet. This constant need for sustenance, of course, was bound to lay waste to the surrounding country... the settlers needed every resource they could get their hands on. Another important reason to clear the forests was the need to utilise the land for agriculture. Having imported a number of different types of livestock—livestock that would later hinder the forest’s regrowth through their constant grazing—farmers were forever pushing to create more room, and thus more resources for themselves and their operation. Later research has uncovered that this was an intentional economic strategy on part of the settlers who realised it was essential to strengthen their local, animal husbandry industries. There was still no way, however, that the early settlers could have had any real comprehension of the environmental damage that was being done, not to mention the many years of repair afforestation would take. Wikimedia. Creative Commons. Credit: Christoph L. Hess. Hallormsstaðaskógur, located in East Iceland, is the country's one National Forest; birchwood remnants at Hallormsstaður farm were officially protected in the year 1905, thus becoming the country's first national forest by default. The nearest town to Hallormsstaðaskógur is Egilsstaðir, making it an essential stop for any visitors travelling to the East. Egilsstaðir is the largest town in this quarter of the country, boasting a population of over 2000 people, as well as a hospital, airport and college. Due to these amenities, Egilsstaðir is still considered to be an administrative centre of east Iceland, as was the town’s intention upon being founded in 1947. Today, Hallormsstaðaskógur covers over 750 hectares and contains over 85 species of tree from over 600 different locations on earth. The area is particularly beloved by both nature enthusiasts and hikers thanks to the many scenic trails that lead through the woodlands. All in all, the trails in the forest measure up to 40 kilometres in total. Active glacial streams (perfectly fine for drinking) also present valuable opportunities for berry and mushroom picking, as well as the chance to see some of the forest’s wildlife. Wikimedia. Creative Commons. Christian Bickel. A quick note on picking from the forest; it is an imperative that you have a clear understanding of which mushrooms/berries are edible in order to avoid serious injury. Edible mushrooms found within the forest include the slippery jack, birch bolete and larch bolete. Regarding berries, visitors will find an abundance of raspberries and redcurrants, dependant, of course, on what time of year one visits. Among the different bird species that call Hallormsstaðaskógur home are common redpolls, ravens, rock ptarmigans and goldcrests, joined in the summer months by other migratory species, such as meadow pipits, redwings, Eurasian woodcocks, wagtails and snipes. Hallormsstaðaskógur is so abundant with birdlife due to the fact that these species use the thick tree cover as a natural shelter from Iceland’s larger predators. It is also a clear and readymade source for nesting and food. In the month of June, visitors can partake in Skógardagurinn (“Forest Day”), a weekend of adrenaline-fuelled competition, lively folk music and all-around festivities. Among the major draws are the two mini-marathons (4 km and 14 km respectively), locally-sourced BBQ lamb, a variety of art exhibitions and even a logging competition. From: Reykjavik Observation Deck | Perlan Museum 360° Viewing Platform. Öskjuhlíð hill and woodlands, found in the Icelandic capital, Reykjavík, can be easily identified from two major factors: the large birch trees that seem to cut into the sky and the shining dome that is Perlan Museum and observation deck. One hundred years ago, Öskjuhlíð resembled nothing of what it did today. In fact, the hill was little more than gravel and rock, still providing incredible views over Faxafloi Bay, but without the woods, without the observation deck, without the picnic benches and art sculptures. In fact, the entire area was used purely for construction purposes, with rocks being excavated from the hillside in order to be transported down to the city to be used as building material for the Old Harbour. This quarry, now abandoned, can still be visited. Around 1950, efforts were made on part of the locals to rejuvenate the area, hence the planting of spruces, birches, aspens and pines. Today, over eighty species of tree can be seen here, proving just how fast an effective reforestation process can be. Wikimedia. Creative Commons. Credit: Thomas W. Fiege. Öskjuhlíð is the primary outdoor recreation space in Reykjavik, boasting a number of trails suitable for both hikers and mountain bikers. Some of these routes lead right down to the picturesque shoreline, Nauthólsvík, and continue along toward the coast at Seltjarnarnes. During the Second World War, the occupying American forces built a number of bunkers on the hill. These can still be seen and even ventured into today, even though there is no light inside and the relics have, at best, been left neglected since their abandonment in 1945. Kjarnaskógur Woodlands can be found just south of Iceland’s “Northern Capital”, Akureyri, and makes for a fantastic day of outdoor recreation during your travels in the region. Covering approximately 600 hectares, over one million different trees have been planted in Kjarnaskógur in the last fifty years. 1952 saw the very first tree plantings with an intention on the part of the local municipality to grow Kjarnaskógur so large that it fully encircled Akureyri. Today, the dominant trees are birch and larch (though others do exist), and the forest’s reputation is known for its diversity, boasting over 230 different species of vegetation. Kjarnaskógur is a particularly merry day out for travelling families; the forest boasts two children’s playgrounds, BBQ facilities, a volleyball course, a bird watching shelter and picnic areas. Avid hikers will also find a 7-kilometre lighted trail, as well as countless backcountry routes, whilst mountain bikers have a 10-kilometre track laid out just for themselves. During the winter months, certain trails are also converted to allow for off-piste skiing and snowboarding, two sports that are highly popular amongst the Akureyri locality. Wikimedia. Creative Commons. Sten Porse. It was only a joke, based solely around this area’s nickname and the fact its trees are somewhat diminutive in size. In fact, the Friendship Forest is not a forest at all, but rather a ceremonial garden, set out in the sticks of the western countryside, dedicated to Iceland’s international relationships with other nation states. The reason for this location, nestled deep in Kárastaðir country, is down to its proximity to Þingvellir, once home to the oldest elected parliament in the world, the Alþingi. Vinaskógur’s location was chosen to remind its visitors as to the importance of peace, friendship and connection among all men. The Friendship Forest was established in 1990 alongside the National Reclamation effort, Landgræðsluskógar, a movement which pushed to begin repairing the country’s infertile soil and treeless plains. Since the project began, group members are thought to have been responsible for planting over one million saplings annually. Over the years, foreign dignitaries invited to Iceland have, alongside those in charge, planted a tree in order to signify their allegiance with our small, Nordic nation. A quick look around the friendship forest (...and quick it will be) hurriedly reveals a number of plaques attached to each tree, each of which is written in the language of the gift-bearers country. Wikimedia. Creative Commons. The Russian Presidential Press and Information Office. The President of Iceland—currently the widely popular Guðni Th. Jóhannesson—is the Friendship Forest’s official guardian, whilst its care and maintenance are left to the Icelandic Forest Service. All lands managed by the Icelandic Forest Service are classified as National Forests, of which there are 53 patches across Iceland, excluding the Westfjords region. So no, whilst the Friendship Forest cannot really be described as a forest, or indeed much of a wooded area, it would be remiss for us to miss it from our article, especially given the notion that it is a little more than a five-minute point of interest on the Golden Circle route. It is clear that afforesting Iceland is very much at the forefront of this nation’s environmental plan. This is because of the clear and concise reasons as to why afforestation is such a good combatant to further natural degradation. The first of these reasons is to fix soil erosion, a problem exacerbated by the fact that almost all land in Iceland is used for sheep grazing. This means that the low lying vegetation essential for a fertile landscape is often eaten, thus pulling the roots from the soil and diminishing it of any useful nutrients. This type of erosion spreads like cancer across the landscape, affecting ever larger regions whilst threatening those that are still hospitable for life. Another reason, this time cultural, is to create areas of woodland that human beings can enjoy for recreation. Forests and woodlands act as an essential escape from the rat race, allowing people to reconnect with nature and learn more about their environment. Third, Iceland’s lack of biodiversity comes down to, in large part, to the lack of forests here. Take, for instance, the lack of forest birds in the country such as the Eurasian wren and the common redpoll; this is a direct consequence of the fact that these creatures do not have the habitat to survive here in large populations. This is as true with many other animal, bird and plant species in Iceland. Arguably, however, the most crucial reason to continue and in fact accelerate the afforestation process in Iceland is down to domestic wood consumption. Timber is used for a great number of things in our daily life, which poses a problem for Iceland, a country now lacking in that very resource. This means that Iceland is forced to import wood from overseas, resulting in a large dent to the local economy, as well as the continued emissions of Carbon Dioxide. One of the Iceland Forest Service’s major ambitions is to have afforested 12% of the country by the year 2100. Currently, Icelanders plant approximately three million seeds a year, though the Forest Service is looking for this to improve with further, all-round education. One of the more interesting trends to come out of the afforestation movement is how the Iceland Foret Service is choosing to plant non-native seeds. Iceland's native tree species include Birch, Aspen and Rowan, though these are now widely considered to be unsuitable for withstanding the ever-warming climate of Iceland. Other factors that must be considered include how the trees cope during the summer months, how fragile they are in regards to sudden temperature changes and, finally, how do they deal with drought? All of these scenarios and more must be thought out to the highest degree before the Icelandic Forest Service begins to implement a new afforestation programme. Have you visited any of Iceland's forests? What are your thoughts on Iceland's efforts to afforest the country in the future? Make sure to leave your comments and queries in the Facebook comment's box below.